View of “Prelude to The Shed,” New York, May 13, 2018. Photo: Iwan Baan. IT’S HARD THESE DAYS to stand out as a performance space in New York. Every arts venue in the city seems to be developing a hybrid visual art and performance program: the Whitney Museum of American Art, the New Museum, the Museum of Modern Art and MoMA PS1, the Park Avenue Armory, Performance Space New York. Even the Metropolitan Museum of Art has a performing arts series. So what’s a new cultural venue to do? One idea is to make it really, really bigsay, two hundred thousand square feet. Another might be to hire Diller Scofidio + Renfro to design an eye-catching structure with some kind of unusual architectural featurelike a telescoping glass outer shell that can extend to cover the nearby plaza and provide another seventeen thousand square feet of climate-controlled performance space. Welcome to the Shed, due to open next spring in Hudson Yards on the west side of Manhattan. A third strategy for making an entrance into this already saturated field is to commission a manifesto that provides a historical rationale for your presence. To this end, German art historian Dorothea von Hantelmann has penned the essay “What Is the New Ritual Space for the 21st Century?” Published in May as a booklet to accompany the venue’s two-week preopening program, von Hantelmann’s text, a reflection on communal spaces since antiquity, serves as intellectual justification for the Shed’s existence and technological gimmickry. Von Hantelmann’s writing has long been devoted to the conjunction of exhibitions, public space, and performativity. In this latest essay, she asks: If theater was the ritual space par excellence of antiquity, the church was the ritual space of medieval Europe, and the museum was the ritual space of industrial societies, what is the paradigmatic one for today? Von Hantelmann understands ritual space to be an arena in which society communicates, enacts, and maintains its cosmology. Theater is organized by what she calls “the appointment” (an implicit social contract that the audience will show up at a specified time and place to attend a performance, a church service, a political event, etc. ); the term museum, by contrast, designates experiences structured around “opening hours” (the agora, the shopping mall, the museum itself). The former is collective but, as a social space, too rigidly conformist; it is “the one (or the few) who speaks to the many.” The latter is individualized, but lacks social cohesion; in the museum, “the many communicate with the many.” As such, it corresponds to the fundamental values of modern Western society: “the individual, the object, the market, progress, pluralism.” The problem today, she argues, is that this ideology of atomization and discreteness (the autonomy of works of art, taxonomies of display, the privileging of the visual, etc.) is not conducive to long-term social connections. The architecture of a space matters less than how it is used—this should be obvious to anyone. The ideal new ritual space, then, will rework exhibition conventions in three key ways. First, it will overcome the primacy of the visual to accommodate what von Hantelmann calls an “interplay of gatherings”in other words, the institution will also present music, poetry, dance, theater, and so on. Second, its organizers won’t choose between the appointment and opening hours, but rather will offer a combination of both. Third, the space will have a protean topologya movable, transformable structure that can be architecturally adjusted to accommodate different formats over the course of the day. THE FUN PALACE has become the art world’s go-to example for utopian architecture. Viewed simply as an architectural plan, the Fun Palace seems like an appropriate model for this kind of space: It was designed as a multidisciplinary venue(its consultants included Buckminster Fuller and Yehudi Menuhin) and has a flexible, modular structure that could be adapted by its users to their needs. Its numerous ambitious featuresincluding a moving catwalk, gantry crane, inflatable conference hall, ventilation tracks, sewage purification, and gigantic adjustable blind shading a rally platformnevertheless proved too expensive and impractical to realize.2 But the Fun Palace wasn’t just a physical shell: Conceived with progressive theater director Joan Littlewood, it was intended to be an interactive environment with a social agenda, retraining working-class East Londoners to engage with new technology in a fusion of entertainment and education.3 “Learn how to handle tools, paint, babies, machinery, or just listen to your favorite tune,” Littlewood suggested. “Try starting a riot or beginning a paintingor just lie back and stare at the sky.”4 Von Hantelmann’s characterization of the Fun Palace substantially reorients it away from the agit-prop street-theater context of ’60s London to better fit our current society: in her words, “large, concentrated groups of people, individualization, flexibilization, constant change, and the increasing involvement of consumers.”5 It’s a staggering rhetorical shift that takes up what is most proto-neoliberal in Price (the mantra of flexibility) and rebrands it as prosumerism. 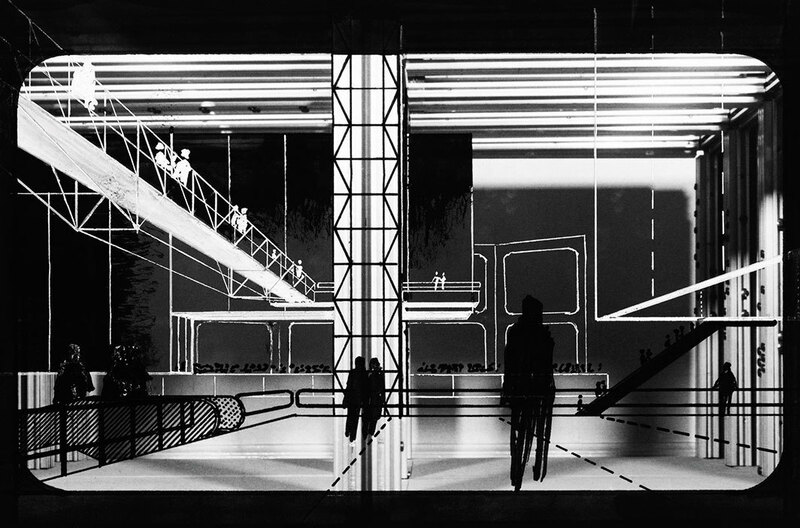 Cedric Price, Fun Palace: Interior Perspective, 1964, colored pencil, graphite, ink, and gouache on paper, 18 5⁄8 × 27 1⁄2". “Prelude to The Shed” occupied an empty lot across Tenth Avenue, between Thirtieth and Thirty-First Streets. The performances took place in and around another flexible structure, this one by Nigerian architect Kunlé Adeyemi. Perhaps unsurprisingly, the centerpiece of the program was Tino Sehgal, who uses many of von Hantelmann’s arguments to explain the production of social space in his “situations,” while she, in turn, positions his work as the culmination of her 2010 book How to Do Things with Art. 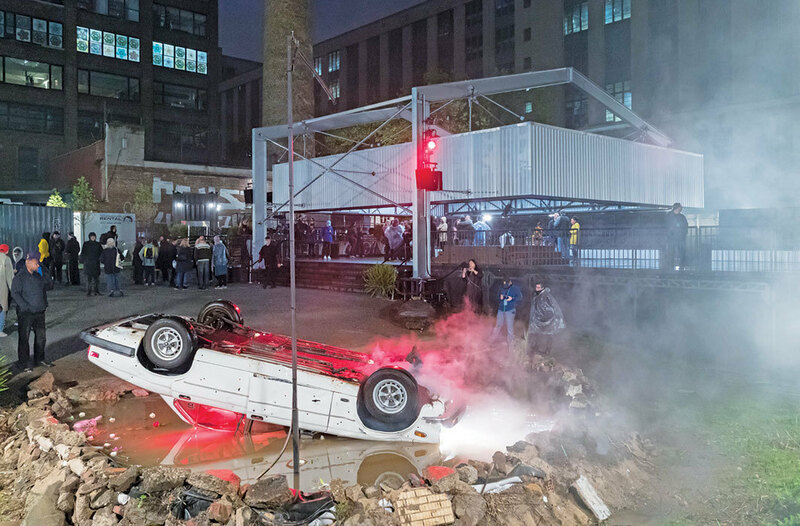 Adeyemi’s walls, which doubled as seats, could be pushed together to create a dark room in which Sehgal’s This Variation, 2012, was performed, or sporadically opened for the staging of a William Forsythe duet on the plaza outside or for dance battles by the D.R.E.A.M. Ring dancers. In the mornings, Schema for a Schoolan experiment in “new models for teaching and learning” run by artist Asad Raza and Princeton academics D. Graham Burnett and Jeff Dolvenwas held for a preselected group of students. In the evenings, the structure was used for music performances, lectures, and panel discussions with participants ranging from Azealia Banks to Richard Sennett. Meanwhile, on the plaza, three assistants wheeled trolleys containing facsimiles of Price’s architectural drawings, including a proposal for a “wind sleeve” at Hudson Yards in the late 1990s; interested members of the public could engage the trolley-pushers in limited conversation about the drawings. “Prelude to The Shed” was exactly the kind of hybrid performance-space-as-exhibition that von Hantelmann takes as the starting point in her essay. Some elements of the program were continuous, some events were held at given times, with everything merging in a flux of different genres of dance, performance, contemporary art, and popular culture. On the afternoon I attended, the program scrolled smoothly through four or five elements within thirty minutes. While these transitions were well done, the total impression was less of a new ritual space than of quality decoration for an area where a cozy pied-à-terre will set you back $12 million. In this context, the Price trolleys offered the memory of participatory architecture in the register of defanged ancient history, rather than as a way to put critical pressure on actual real estate. A Schema for a School is one thing; the more radical proposition would be a cultural institution that includes within its architecture crucial services like a public school, day care, or a branch of the New York Public Library. Construction view of Diller Scofidio + Renfro’s the Shed, anticipated completion 2019, New York. Photo: Iwan Baan. Historically, ritual spaces have served to paper over class differences, subsuming them in the name of a higher unity (religion, nation, culture, etc.). Ritual spaces are carefully curated, and the FAQ page on the website for “Prelude to The Shed” gives a taste of the social control behind it: no outside food or beverages, no chairs or blankets, no flags or signs, no pets, no selfie sticks, no umbrellas, refreshments available for purchase only with a credit or debit card (no cash transactions). It’s the familiar jargon of POPS—privately owned public spaces. The space might ostensibly be open to all, but participation is invitation-only. One can only imagine the security response if a group of street dancers descended on the Shed’s plaza unannounced and a crowd of spectators grew around them. The sheer scale of the Shed—both physical and financial—means that the problem of its social role is accordingly magnified, even though it’s no singular aberration, but the new normal. The same forces that birthed this monster (supply-side predation, accelerated gentrification, speculative construction) have of course also spurred expansion fever and the development of hybrid programming at other venues in the city—and across the whole country. In 2019, MoMA will relaunch itself as an expanded museum with 30 percent more gallery space, including “a state-of-the-art studio and performance center” to “support a broad range of experimental programming.” This is ironic, given that the museum’s current show is dedicated to Judson Dance Theater, which reshaped the history of choreography from the basement gymnasium of a late-nineteenth-century church. New York produced much of its best art when the city was a bankrupt ruin. This is not a romanticization of poverty, just an acknowledgment that radical experimentation doesn’t need seventeen thousand square feet of high-tech retractable pavilion. The architecture of a space matters less than how it is used—this should be obvious to anyone. The Shed’s fine line between culture and control underscores that spaces today don’t need to be curated, but occupied. The surge of occupations that have taken place since 2011 have something in common with von Hantelmann’s performance exhibitions, at least formally: They are not governed by the appointment or opening hours, and are durational and provisional. Yet food, chairs, blankets, selfie sticks, and protest signs are welcome. And unlike a cultural event, embodied assembly has the capacity to constitute a people, as Judith Butler reminds us: Occupations are not window dressing for real-estate investment, but the forging of alliances among disparate groups who enact and oppose precarity.8 New York doesn’t need another curated cultural venue. We need to reclaim public assembly. 2. The Fun Palace became a point of reference for the Centre Pompidou (1977), designed as a multiarts space with a flexible architecture that also turned out to be far too expensive to fully realize. In 1976, a smaller, cheaper version of the Fun Palace was constructed as a community center in North London. The InterAction Centre in Kentish Town had a ludic architecture based around a long structural truss that supported temporary configurations of containers and cabins. It was demolished in 2003. 3. As Stanley Mathews recounts, “The working class population of East London could use cranes and prefabricated modules to assemble learning and leisure environments, creating spaces where they might escape everyday routine and embark on a journey of creativity and personal development.” Stanley Mathews, “Cedric Price—From ‘Brain Drain’ to the ‘Knowledge Economy,’” Architectural Design, January–February 2006. 4. Joan Littlewood, cited in Ian Youngs, “Joan Littlewood’s ‘Fun Palace’ Idea Realized 50 Years On,” BBC News, October 4, 2014. 5. Dorothea von Hantelmann, What Is the New Ritual Space for the 21st Century? (New York: The Shed, 2018), 50. 6. 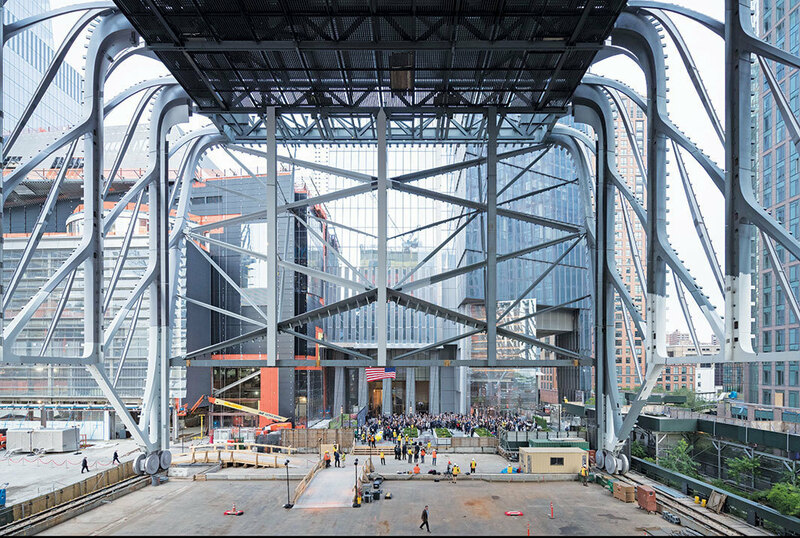 Apollinaire Scherr, “A Prelude to The Shed, Hudson Yards, New York—‘An Impressive Roster,’” Financial Times, May 4, 2018. 7. Poots, cited in Calvin Tomkins, “Alex Poots: Performance-Art Impresario,” New Yorker, December 5, 2016. 8. Judith Butler, Notes Toward a Performative Theory of Assembly (Cambridge, MA: Harvard University Press, 2015).